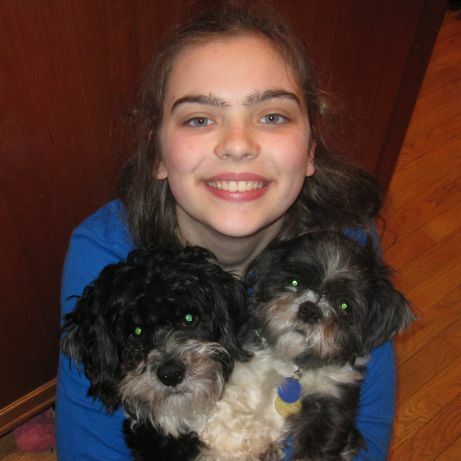 eIMACS student, Fiona Brady, with two of her family’s three dogs. This month the IMACS Blog speaks with IMACS student, Fiona Brady. According to Fiona’s mom, Susan, “IMACS was the first time Fiona had encountered a community of teachers and learners who were excited to hear her ideas and creative ways of problem solving.” After the Brady family moved out of the area, Fiona continued taking courses through our distance-learning program, eIMACS. Having studied University Computer Science and AP® Computer Science through eIMACS (and scoring a 5 on the AP® exam), Fiona was able to pick up the Python programming language* when she encountered it at a summer mathematics camp at the University of Chicago with students several years older than she. I’m turning sixteen this fall and I’m in tenth grade. I’m a second degree black belt in Tae Kwon Do, and I enjoy figure skating and horseback riding. I don’t feel like this gives a real image of me, but there it is. I enjoy making things with cardboard and duct tape, but definitely not wallets. I’ve made my Halloween costumes for the last few years. The year before last, I was Medusa. I wore a snake hat that I built in my bedroom and needed to turn sideways to get out. I have since learned that on some occasions it is important to get dressed outside of your room. When I’m not doing math, I love reading. You are homeschooled and also taking college classes at Northwestern University. What is it like to do both? How do you balance the academic workload, extracurriculars and time with friends and family? Homeschooling is not like regular school because there is no large division between having fun and learning. So I don’t balance it. However, when I have a large assignment due, my mom probably doesn’t see me for two days. My extracurricular activities — skating, horseback riding and Tae Kwon Do — force me to do something active. I also enjoy volunteering at the barn where I ride because they work with children with special needs. Our three dogs keep me pretty busy too, especially my own puppy, Mole (named because the white fur around his nose made him resemble a star-nosed mole when I first got him). What circumstances led you to take university classes? I have always liked math, so I started taking more than one math class a year. In my eighth grade year I took five. After that, I sort of ran out of other options. I participate in the University of Chicago’s Young Scholars Program, which is led by Professor Paul Sally. He and others at Chicago gave me advice and helped to set up a meeting with the head of the Northwestern Math Department, Professor Mike Stein. Professor Stein gave me permission to sit in on the courses, and introduced me to the professors. Which classes are you taking at Northwestern? How did your IMACS courses prepare you for those classes? Last year I took a course on Abstract Algebra and one on Multivariable Calculus and Linear Algebra. This year I am taking Physics and Analysis. IMACS was the first place where I encountered the idea that to learn something you have to own it; that is, you have to be able to form a picture of it in your head, and you need to be able to construct it from basic principles. In the IMACS computer science classes I took, you really needed to do that, otherwise you would get lost in the middle of writing a program and forget what you were doing. IMACS Logic for Mathematics is a continuation of that because it is constructing the basic principles of mathematics, which are skipped over in most high school classes (but assumed to be known in college courses). What advice would you give to young students who are thinking about taking university classes before they officially enter college? Ask your teacher questions. I’ve had people in classes ask me questions, instead of asking the teacher. That’s a really big mistake, and it’s an even worse mistake to make in college because the professors are amazing. One of the things I most admire about the professors I’ve had at Northwestern is the unshakably solid understanding they have of the material. Also, if your professor asks the class a question and you think you know the answer, you should raise your hand. Even if your answer is not correct, that just gives you the opportunity to ask a question and figure out what you don’t understand before you try to learn something that builds on it or have a test. *IMACS added Python to University Computer Science II in November 2012 after Fiona had completed the course. Are you homeschooling a bright child? IMACS offers university-level courses in online computer science and mathematical logic at www.eimacs.com and gifted math courses for middle school students at www.elementsofmathematics.com. “Like” us on Facebook to get free weekly IMACS logic puzzles.